Tsukemen was a novelty two years ago in Vancouver. Now it has nested and made itself comfortable on a lot ramen-yas’ menus in town. I guess Vancouverites like to dip and slurp. This specialized noodle has proliferated enough that one can have a serious discussion on who makes the best Tsukemen in YVR. I will be judging the awesomeness or crappiness of the Tsukemen based on the Dipping Broth, Noodles, Char Sui and Toppings. 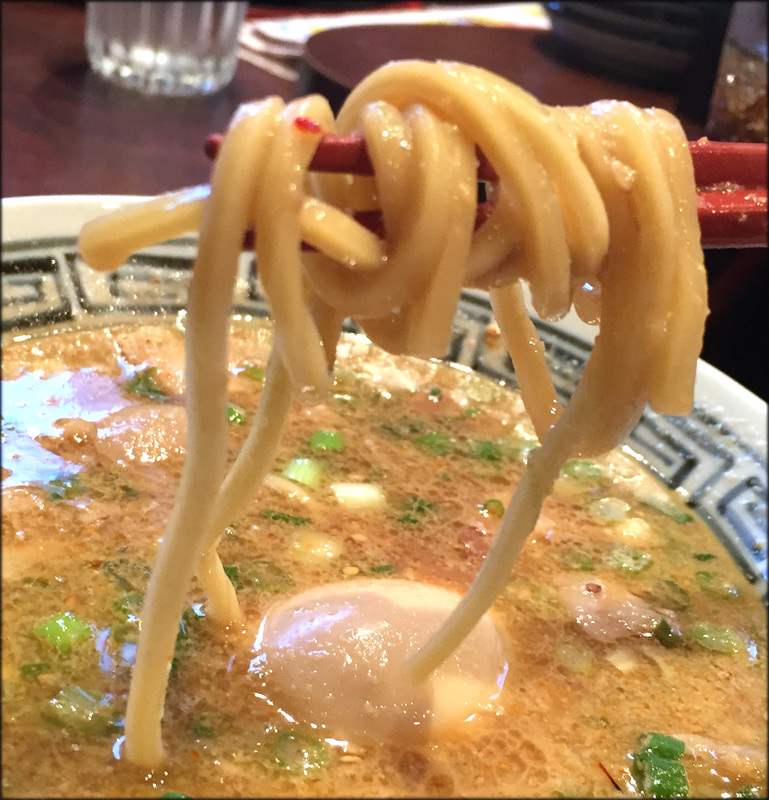 When Taishoken opened, their dipping noodles were a revelation of how good the dish could be. Since the Summer of 2014, the shop has changed hands. I thought it was a good time to re-check the quality and deliciousness of their Tsukemen. Taishoken Broth: The dipping sauce was thick and intense but it was served luke warm. The glossy soup was salty and had a roasted gravy quality. To be honest it reminded a little bit of cafeteria gravy and didn’t have the complexity I remember enjoying when Taishoken first opened up. Taishoken Noodle: The yellow curly noodles were cold, thicker, and had a good bite. The very weird thing is the noodles came first before the soup. I’ve had others tell me the same happened to them as well so this was not a one off. Why not serve noodle and soup together since you cannot have Tsukemen without the soup. This was a bizarre situation since a good 5 minutes elapsed before the soup showed up. Taishoken Char Sui: The pork slices were coarse and lost in the soup. Taishoken Toppings: To complete the dish I got a slightly over cooked ramen egg, green onions, nori, plain bamboo shoots (the flat kind you can get from a can – not menma) and one fish cake. 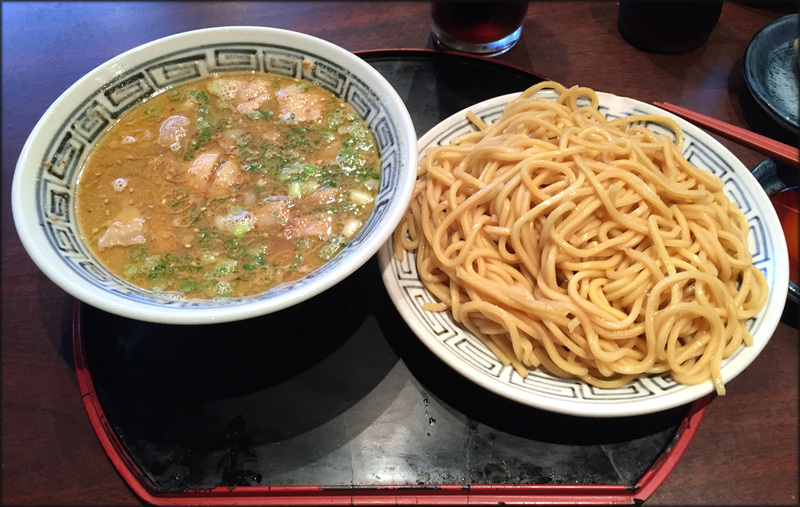 Taishoken Overall Impression: I was very disappointed with the Tsukemen I got from Taishoken in comparison to the version I enjoyed when they first opened. The split up service of the noodle and dipping sauce was just odd and delayed my enjoyment of my meal. The soup was very one note and not as complex as the one that was first served. 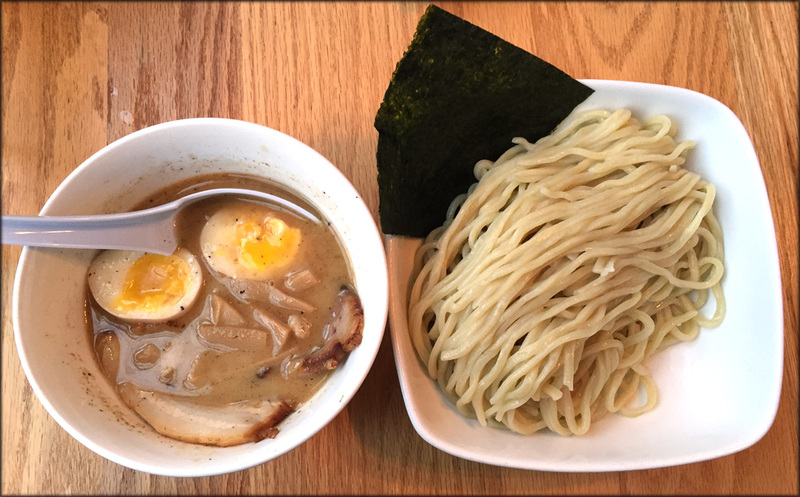 The Menya Kouji group, which owns Ramen Butcher, is affiliated with the original Taishoken in Japan that gave the world Tsukemen. 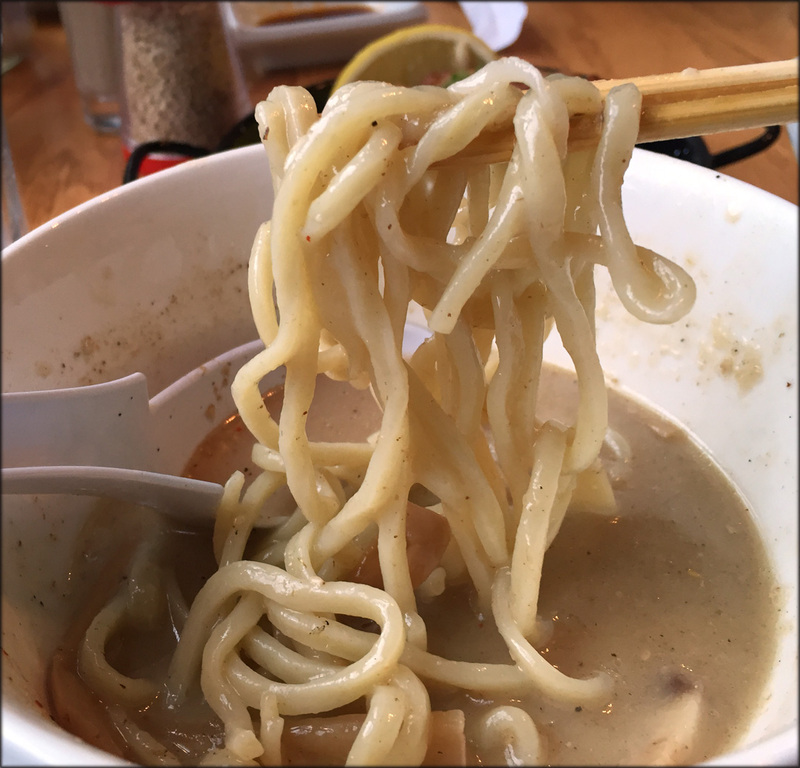 When I first visited this Chinatown ramen-ya, their regular noodles didn’t really stand out to me. However they had not begun to offer their dipping noodles yet. I was very intrigued, given their history, how Ramen Butcher’s Tsukemen would be. The Ramen Butcher Broth: The soup is slurry-ish but not as thick as Vancouver’s Taishoken, but it coated the noodles well. It had a lighter seafood flavour inspired by Benito flakes: sweet, umami and smoky. The broth was served hot but cooled down rapidly with each noodle dip. The Ramen Butcher Noodle: The straight beige strands were thicker than one used in Ramen Butcher’s traditional ramen bowls. The noodles were cold and al dente. The Ramen Butcher Char Sui: The fattier slice was luscious, tender, and melts in your mouth. The lean slice unsurprisingly was a bit course. Much like Taishoken both slices were submerged in the broth. The Ramen Butcher Toppings: To complete the ensemble, I got a slightly over cooked ramen egg, and the plain canned bamboo shoots. Usually Ramen Butcher’s Tsukemen has green onions too but I asked for them to be omitted. 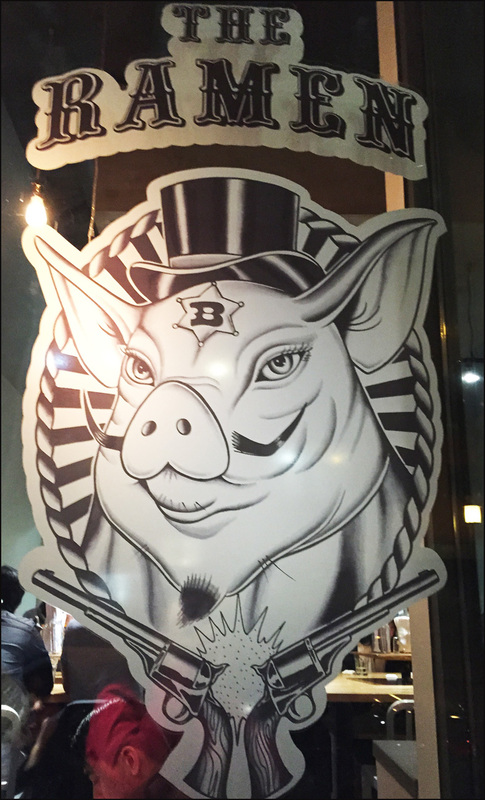 The Ramen Butcher Overall Impression: I really enjoyed the complex yet lighter flavour of the soup. The smoky and seafood enriched dipping sauce makes Ramen Butcher unique and delicious. Santouka Broth: The hot soup was very thin and had an oil slick on top. One can see shavings of meat in the soup. Like its ramen broth, the tsukemen broth has a smooth salty umami flavour and was bolstered by a soya sauce sweetness. The liquid did not coat the noodle but definitely added flavour to the dish. It also was not as overwhelmingly salty as the other tsukemens. Santouka Noodle: The square yellow thick noodles were served cold. They are very different than their thinner noodles in their regular ramen. The strands are very bland on its own, but once dipped absorbed the flavour of the broth and a lye after taste emerged. Santouka Char Sui: Unlike the other competitors, Sanouka serves chunks of stew fatty pork and not slices of char sui. The pieces of pork remind me of Korean Bossam but in cube format. The pieces with fat layers were very tender. The leaner pieces were a bit tough. Santouka Toppings: Unfortunately Santouka’s egg was very over cooked and chalky. They were the only one to use Menma Bamboo. There were also green onions topping the broth. Santouka Overall Impression: Perhaps I’m really Santouka biased, but I really like the meaty savouriness of the dipping broth even though it almost had the same soupy consistency as its regular ramen. However I really didn’t like the hard boiled egg. I was not expecting The Ramen Butcher to come out victorious. 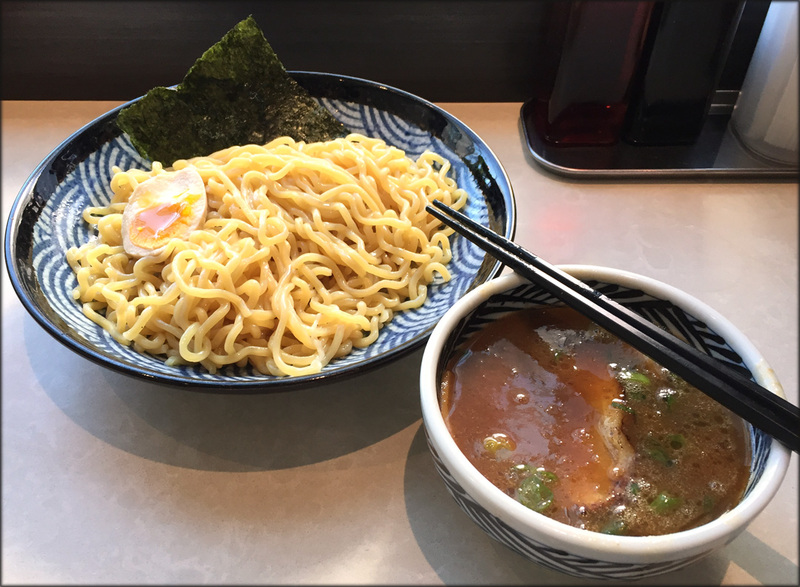 Given my initial experiences, I was surprised with how good Ramen Butcher’s smoky Bonito flavoured Tsukemen was and how much Taishoken had slipped with their odd serving style and monotone soup. For this Food Rumble it came down to Ramen Butcher and Santouka since I thought their broths were the most delicious and nuanced. In the end, Ramen Butcher’s unique seafood soup swayed me. It’s not like anything else on its menu and it is very distinct in Vancouver overall. Also I can’t emphasis how much I didn’t enjoy the chalky egg from Santouka. I recently learned that Ramen Gojiro, another Menya Kouji outlet, has begun to serve Tsukemen as well. I wonder how their dipping noodles differ from Ramen Butcher. Fodder for future Food Rumble perhaps.